We knew that June 1st had the potential for a big severe thunderstorm day several days in advance. 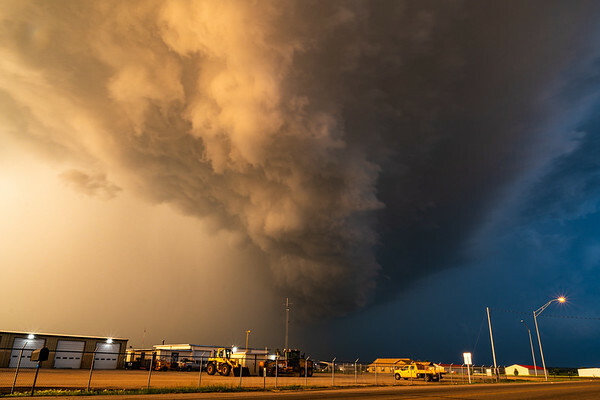 The models suggested that central Nebraska and central North Dakota were going to be the two target areas for the highest tornado potential, with severe weather scattered all along the area in between. Seeing that we had to bring the clients back to OKC for the end of the tours the next day, we decided that North Dakota was going to be out of range and went for the central Nebraska target. -MLCAPE (available atmospheric energy) was projected to be above 4000 j/kg, so tons of energy available. Energy was lower in ND with prominent cloud cover, but there would be enough clearing for boundary layer destabilization. -The 300 mb upper level winds were not expected to be great anywhere across the severe threat, but were projected to be stronger, and with prominent directional divergence, in the North Dakota target as the upper level trough became negatively tilted throughout the day. The Nebraska target would be just out of the range of the trough's most impactful features by 00z. -The 500 mb winds were going to be stronger and get stronger throughout the day in ND, as opposed to very weak to start in NE, but improve by 00z. -The 700 mb winds were expected to become stronger, by 00Z, in NE. -850 and 925 mbs expected to remain backed and gain strength as LLJ picked up around 00Z. In contrast, the low level winds in ND were going to be nearly due easterlies as the surface low pushed east into ND (what you want for tornadoes). 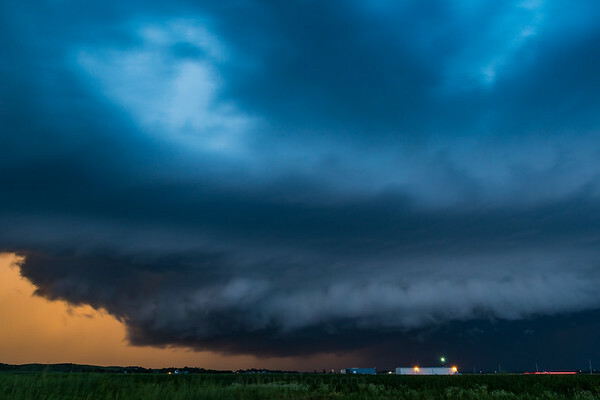 With low level shear and upper level winds being too weak early in the day in Nebraska, and with the boundary advancing and serving as the ignition source for supercells as CIN (convective inhibition) eroded in the afternoon, storms struggled to become tornadic, and stay discrete early on. We'd have to wait for anything that was going to happen later in the day. The part I hate. 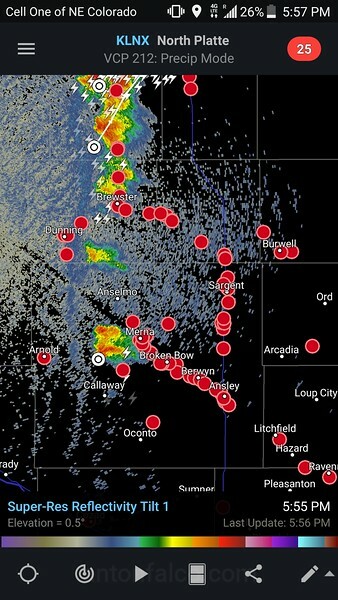 Storms started to fire on the NE/SD border, but were quickly "lining out"- significantly reducing the tornado threat. We decided to wait for the boundary to push east towards us and stay to the south of the quickly lining out thunderstorms, but no developing storms along the boundary were staying discrete. At this point in the day (6:00pm CST), I was becoming very concerned that the day was going to bust; aka, we'd see nothing of significance. There were no storms staying isolated, and the existing storms were not very strong. We were seeing nothing more than rain at this point. The last few storms of the day (at least before sunset) fired along the boundary near Seargent, Nebraska. We waited along the side of the road as they tracked east towards us. The day escalated quickly, as this cell remained discrete for a while. 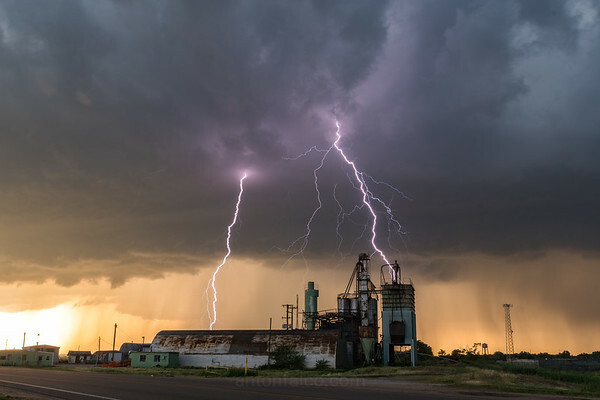 It gave an incredible lightning show with plenty of cloud-to-ground strikes, and as it became absorbed by the the surrounding cells, produced an incredible shelf cloud back lit by the sunset, and produced an embedded QLCS (quasi-linear convective system) tornado for about two minutes. 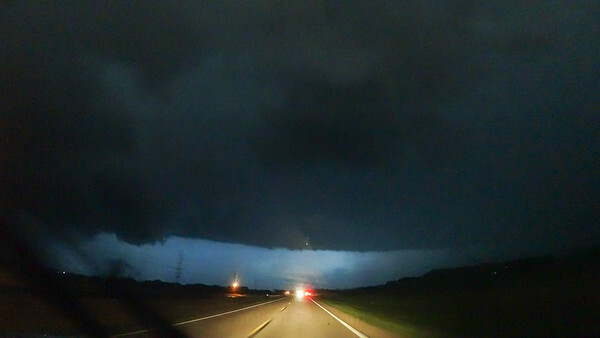 This occurred shortly after dark, and just outside the town of Ord, Nebraska. As this cell became fully absorbed into the line of storms, that line followed us and hit us hard after we arrived in Grand Island, Nebraska. 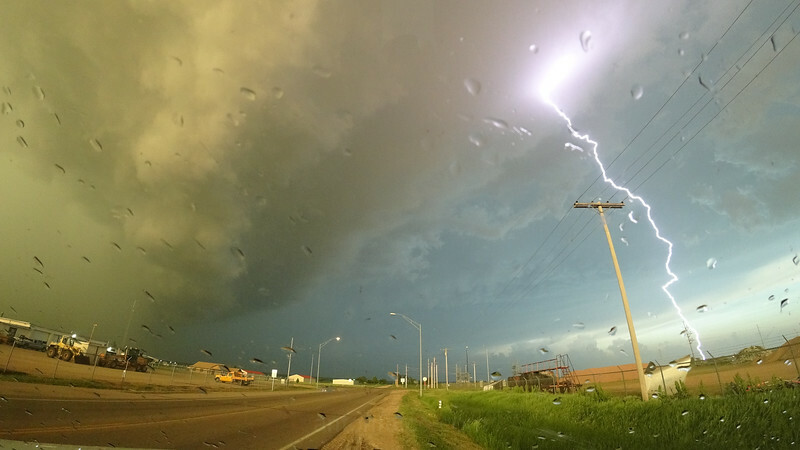 I have enclosed several images of all of the above events, as well as a time lapse of the event itself (including the brief tornado touchdown). Overall, it became an exciting day, considering that about 2 hours before the tornado, I wasn't sure we'd be seeing anything besides rain. Instead, I managed to gather several keeper images. Daily Distance Traveled: ~315 miles.